Pennsylvania’s jobless rate falls to 7.5 percent for April! The unemployment rate, adjusted for seasonal hiring factors, fell from 7.8 percent in March, and was 1.3 percent below the April 2010 jobless rate, the state said. It was the largest year-over-year decline since June 1987. 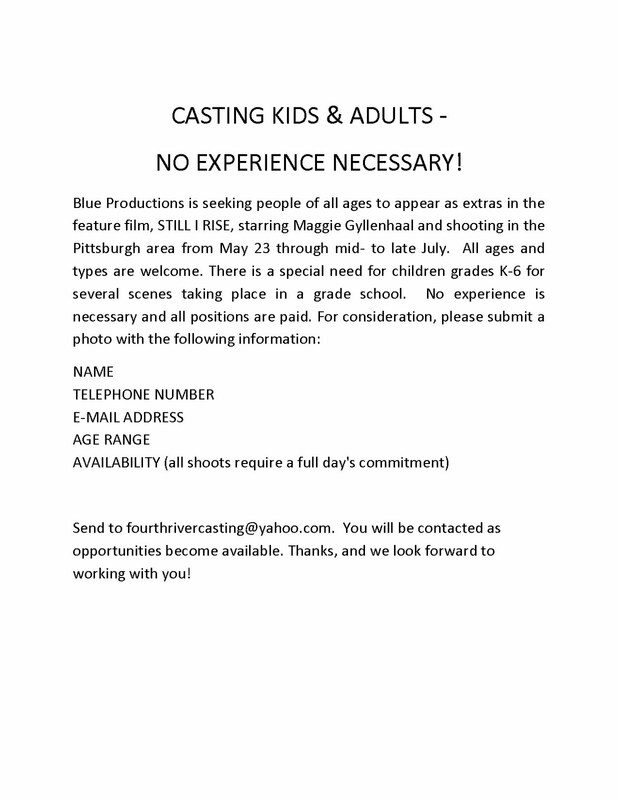 Casting Call for "STILL I RISE", A Movie To Be Shot In Pittsburgh! 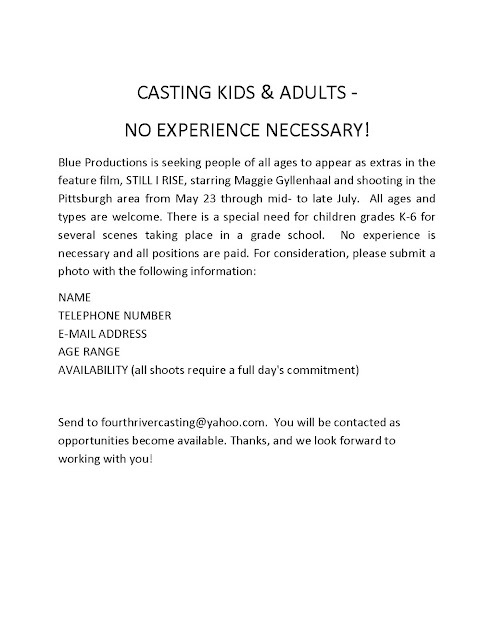 I'm currently working as an extras casting director on STILL I RISE, a major motion picture starring Maggie Gyllenhaal that will be shot in the Pittsburgh area from May 23rd to July. This movie centers on two mothers who join forces to reform a failing public school in their neighborhood. This movie is set in Pittsburgh, and will include several scenes shot in schools. I'm currently hiring kids grades K-6 to appear as extras in these scenes, many of which will include the leads and offer great screen time. In addition to the children's roles, we have a ton of short term opportunities available for adults. All of these positions are paid. I've included a flyer with the basic information, and I'm hoping you can help us get the word out. We need to get the kids on board as soon as we can because the PA Dept of Labor & Industry requires work permits for them; they're simple to get but it's a several step process. We want to get as many kids ready to go before shooting begins on May 23rd as possible. Please let me know if I can answer any questions for you. I'm happy to meet with groups of people for Q & A sessions, and answer e-mails 24 hours a day, fourthrivercasting@yahoo.com. Thanks so much, and glad to be able to keep the film industry in Pittsburgh thriving. U.S. Economy Adds 244,000 Jobs in April! WASHINGTON (MarketWatch) — The U.S. economy gained 244,000 jobs in April, the biggest increase in almost a year, but the nation’s unemployment rate rose to 9.0%, according to government data. Economists surveyed by MarketWatch had predicted a net gain of 175,000. Most had expected job gains to slow from March’s revised increase of 221,000 because of weaker growth in the first quarter and a slew of data that seemed to suggest a slowdown in hiring. 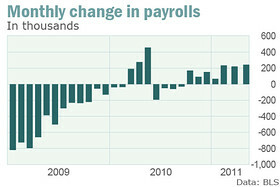 Payrolls for February and March were also revised up by a combined 46,000, the Labor Department reported Friday. The payroll data are derived from a survey of about 400,000 business establishments. 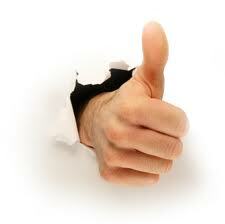 In recent trading, U.S. stocks soared. The Dow Jones industrial average (DOW:DJIA) jumped more than 130 points following Thursday’s selloff. Hiring in the private sector posted the largest increase in five years, with the biggest gain occurring in the retail sector. Retailers hired 57,000 workers last month. Professional and business services created 51,000 jobs, the leisure and hospitality sector added 46,000 positions and health-care companies hired 37,000 employees. The surging manufacturing sector also increased employment by 29,000. The biggest decline took place in government, continuing a recent trend, as public-sector jobs fell by 24,000. Average hourly earnings, meanwhile rose a scant 0.1% to $22.95, while the average workweek was unchanged. Meager increases in wages are a thorn in the side of the U.S. recovery, especially in light of soaring oil prices and higher food costs. Workers have to spend more on basic necessities, leaving less demand for other goods and services. Growth in the U.S. economy is likely to be constrained unless wages rise or the price of fuel and food decline, economists say.